Cosmetic and reconstructive surgery play a major role in today health care. Planning plastic surgery requires to deal with the elusive concept of facial attractiveness, and to evaluate feasible improvements of attractiveness of a particular face. A number of computer tools have been proposed for this purpose. They essentially allow manipulating in 2D or 3D face models, in order to produce images simulating possible surgery outcomes. These images are evaluated jointly by surgeon and patient. In this work we propose a new quantitative technique able to automatically suggest specific improvements to facial attractiveness. 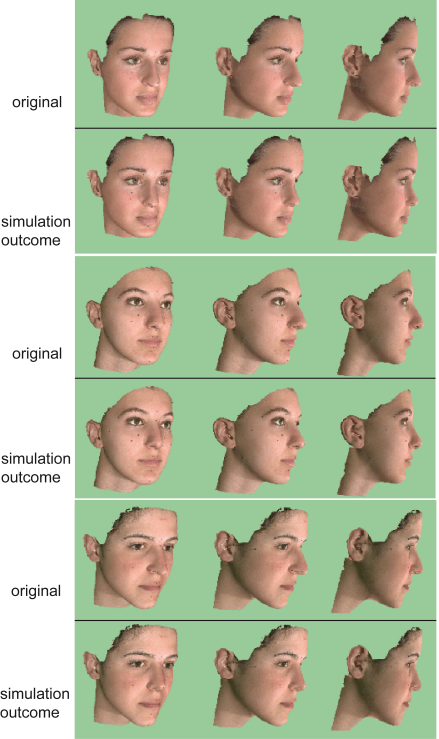 The general idea is to compare the face of the patient with a large data-base of attractive faces, excluding in the comparison the facial feature to be improved. Then, this feature of the faces more similar-excluding that feature- is applied with a suitable morphing to the face of the patient. This approach is based on the prudent but safe assumption, supported by recent research, that there are many attractiveness prototypes. It also allows to evaluate specific expectations, and different attractiveness models due for instance to ethnicity. We do not look for such thing as the perfect mouth or nose, but we try to automatically suggest the mouth or nose that better fit a given face, according to a data base of attractive faces. Our approach has been first investigated in 2D and then in 3D using patients' face model acquired with a 3D scanner. The ratings of the outcomes of the 3D simulations, provided by panels of human judges, show that the system and the underlying idea are effective. Some results of the 3D beautification algorithm, applied to different test cases and related to different facial features, can be seen here.